For God, who said, “Let light shine out of darkness,” made his light shine in our hearts to give us the light of the knowledge of God's glory displayed in the face of Christ. Oh, but there’s more. A South Korean researcher won the Fluid Dynamics Iggy by studying what happens when a person walks backward carrying a cup of coffee. (I wonder why the cat study didn’t qualify for this category.) It took five French and British doctors to win the Medicine prize by using advanced brain-scanning technology to measure the extent to which some people are disgusted by cheese. (Which must make them outcasts in France…) The Iggy in Cognition was taken by four researchers who determined that many identical twins can’t tell themselves apart visually. But perhaps the Iggy that will make the most immediate difference in the world comes in the field of Obstetrics, won by four Spanish researchers who determined that the best way for a developing human fetus to hear music is...well...not by placing a speaker against the mother’s belly. They’re even marketing a product: a speaker designed to pair with a cell phone and to be used in the alternative way. Ignoble? Well, maybe. Unless you suddenly find yourself needing to know whether you’re more likely to spill your liquid cat by walking backward or forward. Or you need to play some music for the little bun you have in the oven. 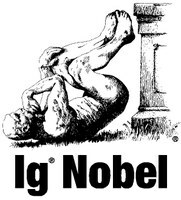 Somebody has to study the “ignoble” stuff, right? Judging from the Bible, God seems to be a big fan of the ignoble. A champion of the common. Lord of the lowborn. It's a redneck shepherd boy, after all, who stands up to Goliath – and with a sling, not armor and sword. (Though, in that particular instance, it seemed to be kind of a situation of bringing a knife to a gunfight.) Moses parted the sea with a staff. A donkey chastised Balaam. And when God wants to send his Son into the world, he comes as a helpless baby, with a feeding trough in a stable in a backwater town as his crib. His message speaks to the common people and often alienates the VIPs. And when he rescues the people he loves, it isn't by raising an army or taking a throne. It's by giving his life as a despised and rejected criminal. Seems that God can use regular people who seem to have little to commend them to do amazing things. A peasant couple in Nazareth receive an angelic visitation and, nine months later, a baby boy who is God With Us. Uneducated fishermen, an ethically questionable tax collector, a revolutionary, and assorted women make up his closest followers. But those followers go on to proclaim the good news and demonstrate the power of God's kingdom to officials, rulers, and kings all over the world. What makes ordinary people able to do extraordinary things? What transforms unremarkable circumstances into remarkable acts of God? What gives nobility to what the world considers ignoble? Paul calls himself and his co-workers “jars of clay;” pots so literally earthy and common that archaeologists today find thousands of shards of them scattered over every dig from Asia to the Middle East to Africa to Europe. Clay jars were to Paul what plastic and styrofoam containers are to us: functional and unremarkable. But God had hidden a treasure inside Paul and his clay-jar colleagues. He had shown them his face through Jesus, revealed to them who he is. His light shone in their hearts, and so they carried around in themselves the gospel of Jesus. They were weak, fragile, yes, even ignoble. They could be cracked, broken, and even destroyed. No one would look at them and be impressed or awestruck. But because they were clay jars, God did remarkable things through them. You might have expected that I'd say “in spite of the fact that they were clay jars,” or something like that. But Paul doesn't say that. Paul reminds us that the ordinary-ness of the messengers witnesses to the extraordinary-ness of the message. In using the ignoble, Paul points out, God demonstrates incontrovertibly that the power of the gospel is in him. It's not in the persuasiveness or faith or piety or courage of the container. It's in the glory and power and grace of God as poured out in Jesus Christ. I wouldn't be surprised if you were a pretty ordinary person living a pretty ordinary life. Oh, I'm sure you have your moments, but I imagine that a fair amount of the time you worry about your weaknesses and stress over your shortcomings. I'm guessing that you see yourself as pretty average, and your life as unremarkable at best and mundane at worst. And I'm pretty sure that, given the choice, you'd say that you consider yourself more ignoble than noble. Congratulations. You're in good company. People like you are just the kind of people God loves to use to do his work in the world. Really, when an ordinary person confounds the world's values and assumptions by showing extraordinary faith or courage, or sacrificing to show love to someone else, or speaking unexpected words of good news at just the right time, then God is glorified. It's clear that he's at work in that ordinary life. Stay with Jesus. Stay close to him, follow him, do what he does, and listen to what he says. His Spirit lives in you, and the treasure of the gospel glitters through the cracks that every clay jar has in it. He'll do remarkable things with you, but that's his business, and he'll do it in his own time and in his own ways. As you take care of your family, or do your job, or shop for groceries, or go to school, or serve in your community, or worship in your church, he'll do his work. Your business is staying close, doing the things he did and speaking the words he spoke.